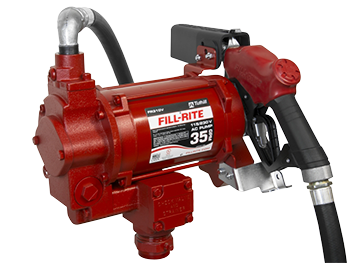 This rugged, positive displacement, heavy pump is UL listed. Explosion proof UL listed 1/3 HP motor (115 VAC-60Hz) with sealed bearings, Heavy Duty switch, thermal overload protection and junction box. Carbon vanes and ceramic/carbon seal reduce wear and repair expense. 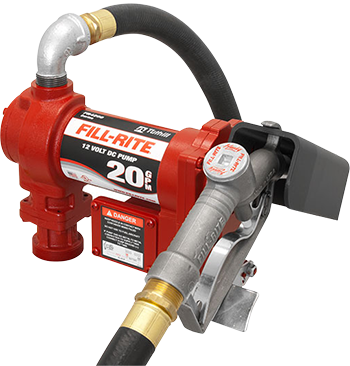 Integral check valve with pressure relief on outlet side reduces pressure drop and improves vertical lift. Easy removable strainer, automatic bypass valve, 2 in. threaded bung for tank openings. 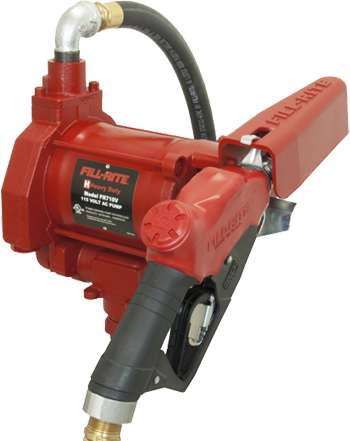 High Flow AC Utility Rotary Vane Pumps Series 300 With a flow rate few pumps can match, this pump provides long life. Explosion-proof UL listed dual voltage 3/4 HP motor (115 and 230 VAC) Motor has sealed bearings, heavy-duty switch and thermal overload protection Built-in junction box Cast iron pump housing with iron rotor and carbon vanes Check valve, pressure relief valve and strainer assembly, Automatic bypass valve, 2 threaded bung for tank openings. Includes 18 ft. hose and 1 in. ultra high flow automatic nozzle. 2 Year Warranty. Already own a pump? Contact us for a cabinet that will work for you! For sales and dealer inquiries contact us today! © 2019 Maverick Industries Inc.